Happy Monday! It’s time for an important announcement. 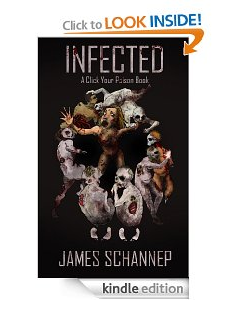 The impossible now becomes… possible–INFECTED is moving from being available only as an ebook. It’s growing up. Evolving. By the end of this month (probably right around Thanksgiving), there will be a paperback version. Just in time for Christmas shopping! Zombies… the gift that truly keeps on giving. Granted, the ebook format lends itself to a more streamlined reading experience, and that will still be available, but there’s demand for a print edition as well. I know what some of you are thinking; it’s called Click Your Poison, what am I “clicking” in a paperback? Nothing, Captain Smartypants. The Click Your Poison brand stays, this is simply the “eAversion Version”. And as a bonus for this edition, rules for the Party Game are included along with a Reader’s Guide in the back of the book. So stay tuned, zombie fans, because there will be a paperback giveaway for my blog followers upon release. Subscribe on the upper left and make sure you don’t miss out!